Every summer our international and former outgoing exchange students present their home and guest countries, respectively, in a colourful exhibition! There you can get an deeper insight into the countries, cultures and exchange destinations. We are glad to invite you to our “mini” international day, which will take place on Monday, June 1 from 12 to 2 pm in the foyer of the physics department. At 20+ stands you can get a better insight into the countries and cultures of our international students, as well as learn about the experiences abroad of our former outgoing exchange students and which are our partner universities. 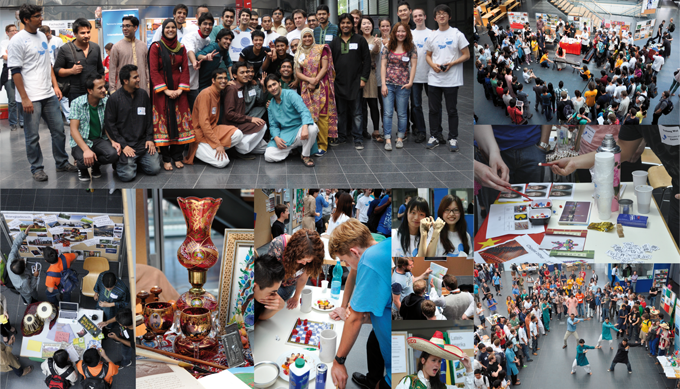 Do not miss this great opportunity to get to know, how international our students are – in all possible ways. At 1 pm we will be enjoying the appearance of the multicultural theater group „The Bacchae Project“, led by one of our students, with a performance out of The Bacchae from Euripides, Messenger A – this is a show you should not miss either! An event of the Departments of Mathematics, Informatics and Physics at the Technische Universität München! Come and join us in celebrating the international flair of our university: music, dance, delicacies, facts and stories from all over the world. Make this your day!